High End Analog Stage for CD- and DVD players. Note also the bundle offer on the "CD Upgrades"page! Complete high end analog stage for CD- and DVD players. Applicable in any model and make. 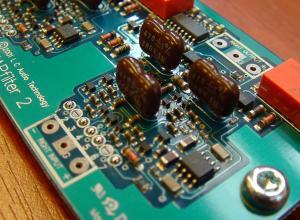 This module takes over all functions from the DAC chip to the output plugs, both RCA and true balanced XLR outputs. The analog signal processing is truly state of the art with a non feedback single end class A operation and filter caps in MICA / silver quality. Active components feature low noise Japanese audio transistors in Class A mode, and vertical bipolar types from Zetex, UK, with ultra high linear performance. The signal path is a straight line on the circuit board, whilst the components are placed in alignment with the signal track to minimize standing waves in the copper wires. The sound is highly detailed, relaxed and with a sense of musical spirit completely new to digital audio media. The input of the ZAPfilter will interface with any type of DAC chip, both voltage and current out put types, so you should not worry whether it will work in your particular model of player. The ZAPfilter 2 is not attached to the CD or DVD player, but only to the DAC chip, and so its connections are independent of the player model, and only specific to the DAC chip. A complete mains power supply is also provided in the kit for installation in the CD player's case. The supply utilize a high quality toroidal transformer and Schottky diode rectification. You can have both unbalanced and balanced output on any CD or DVD player, even if it does not have a balanced output from factory. And it is true studio quality balanced output with no phase splitters involved. Filter caps are of great importance to the sound quality, usually a CD player is equipped with relatively cheap ceramic or Mylar types, and in some cases the better polypropylene types are found in the best off-the-shelf players. However we have taken a step even further to optimize the performance of ZAPfilter 2. We have used only custom made MICA capacitors, which are magnitudes better than even polypropylenes, since MICA caps have lower loss factor, and also it is a natural material, where PP is a plastic. The conductor plates in the capacitor is pure silver, terminated with soft glowed copper wires. 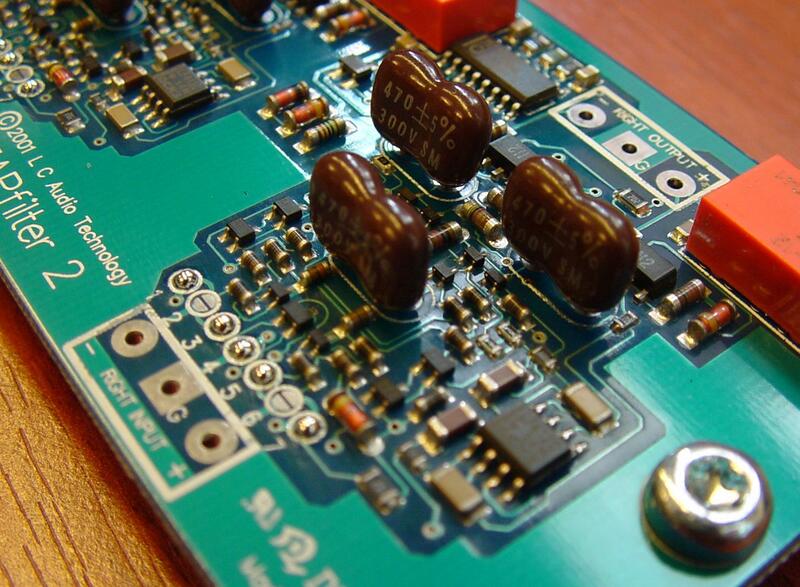 This is simply the best possible type of capacitor for filter application. frequency range, of 20-20.000 Hz, would take two caps of 880.000 uF each. But the shunt regulators have a better function, as they work right down to DC, where even the big caps could never have a low impedance. Rectification is done with Schottky diodes for minimum switching noise, and the transformer is a low noise toroidal type. True balanced output on any CD or DVD player! 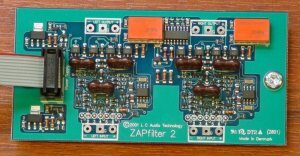 The I/V converter, on ZAPfilter 2, which can also be configured as a V/V input, can read positive and negative signals, and thus can interface evenly to balanced and unbalanced D/A Converter chips (DAC). But this circuit also produces both positive and negative signals, and can if buffered be used to produce a true balanced output signal with any type of DAC. So we installed the necessary buffers on the ZAPfilter module to do just this. So to make a true balanced output, simply drill holes for XLR plugs, and connect to the ZAPfilter 2. Input / Output compatibility table. 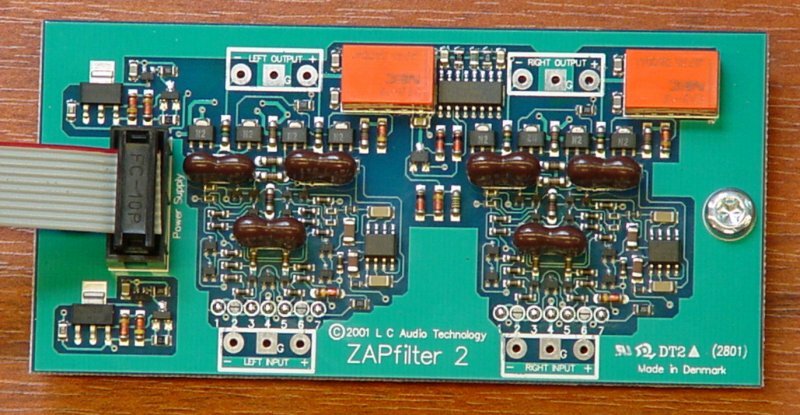 ZAPfilter 2 can interface perfectly to any type of D/A Converter chip, and produce as well unbalanced as balanced outputs. High cut - or anti-aliasing is performed passively as 102 kHz with MICA / Silver caps. The characteristic of the filter is Linkwitz-Reilly, which is recognized for minimum phase error. For connection instructions see the "Connection" link in the left menu! Better sound than a new CD player! With ZAPfilter 2 and a reference clock you can achieve a better sound quality on you existing CXD or DVD player, compared to purchasing even very expensive new models. Page Build Completed in: 0.009 seconds. .